Polaris illuminates the way and eliminates the expense. Like its Northern Star namesake, our new Polaris™ Nightlight illuminates your way and helps you navigate your surroundings. Better yet, because it’s battery-powered, it eliminates the added and often hidden costs associated with hardwired nightlights. So affordable, it may actually save you money. While industry-standard hardwired nightlights may appear more affordable at first, they require additional external wiring and installation labor – a hassle for new construction, and a virtual deal-breaker for renovations. Before you know it, your costs have skyrocketed, and what you thought was an inexpensive little nightlight has become a major budget line item. Priced at less than $50 per unit, the amortized cost over a typical renovation cycle is less than $5 a year – a mere $.01 a day. And since Polaris requires no additional external wiring, you save on costly electrical work and possibly even significant infrastructure renovation. 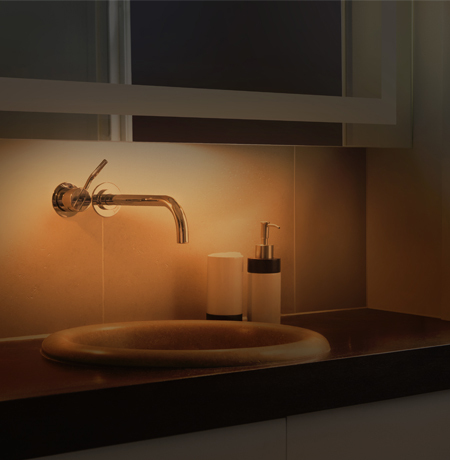 Hardwired nightlights can be left on all night, or even around the clock. In contrast, the Polaris uses energy-efficient LEDs that only turn on when needed. This equates to 60 watt hours per year, at a cost of only $.01 per year. Simple to install. Simple to use. Simple to operate. 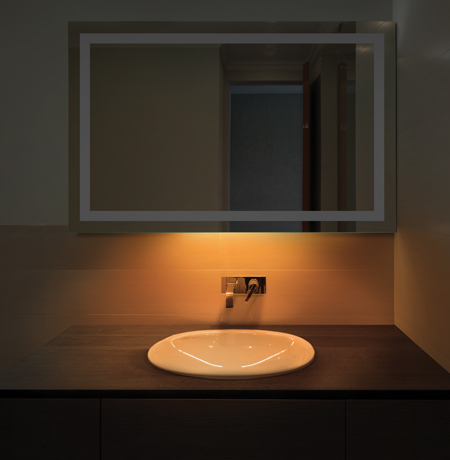 The Polaris nightlight comes pre-installed in your lighted mirror, in a temporary configuration to protect it during shipping. To complete installation, simply loosen the holding screws, move the nightlight sensor into place, and tighten the screws. Using the Polaris is just as easy. The integrated sensor detects both light and motion, and automatically turns the nightlight on when your room is somewhat dark and motion is detected. It turns off again approximately three minutes after motion is no longer detected, or when the lights are turned on. Polaris uses a safe, proven Nickel Metal Hydride (NiMH) battery that provides 16 to 18 hours of continuous light without recharging – far more than the estimated 30 minutes a day of anticipated use. And because it automatically recharges when the mirror lights are on, it will provide years of maintenance free operation. A little package. A lot of features. Is available on most Electric Mirror lighted mirrors and lighted wardrobe mirrors manufactured in the U.S. Illuminate your way with Polaris.